"...... Absolutely unbelievable trip. I wanted it introduce my kids to real sport fishing on this trip. By the way my daughter was ......so glad she went. After getting over the incredible scenery leaving the marina we ran into a school (hundreds) of dolphins. A sight we will never forget. The better part is that there were lots of billfish under them! We landed 13 sails. Everyone, including my daughter and son's girlfriend got a sail! .......at one time we had three sails on at the same time....."
As I mentioned in my e-mail a few days ago, the fishing abroad the Dragin Fly was the highlight of our trip. 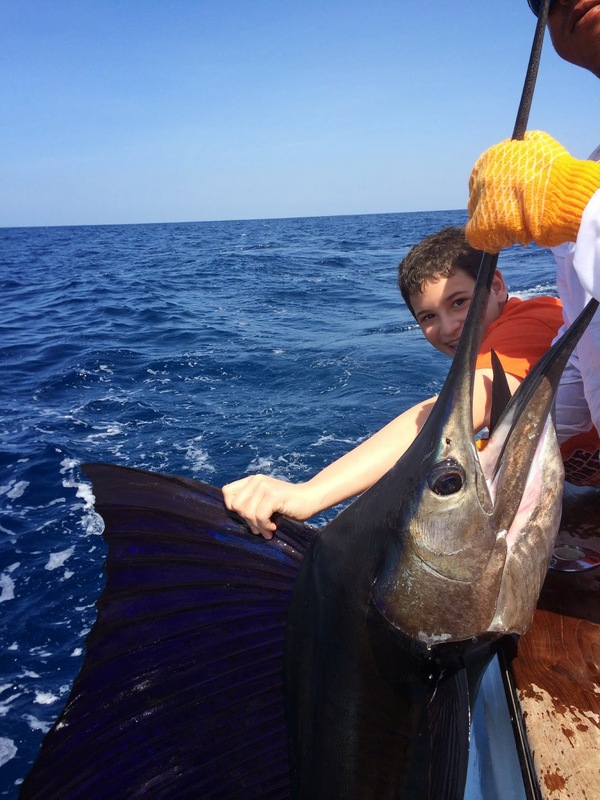 Attached is a picture of my son Daniel with his first sailfish! That pretty much says it all and I’m planning to get him one of your shirts and a small sailfish trophy as a memento of the trip. It was great working with you and Anna and I’ll certainly reach out the next time I take another trip down there. Maybe we can even plan a trip to North Carolina.